Fall is most definitely in the air. The children are back in school and we are planning to close our pool this weekend. Cooler temperatures are also predicted here over the weekend. I'm seeing apple and pumpkin everything online and in the stores. I even got a coupon for a Halloween store earlier this week! Yes, fall is in the air and summer is quickly becoming a fading memory. Part of me is ready. Okay, most of me is ready. I'm ready for cooler days, jeans, colorful leaves, and some structure returing to our days. We are three weeks into the school year and we are finally Finding our Rhythm. This week's Finish The Sentence Friday prompt, however, has me feeling a bit nostalgic for summer. The prompt is "My best summertime memory this year was . . . ."
I have been thinking about it all week and I just can't narrow it down to one. Overall, we had a wonderful, lazy summer. We started with this Summer Bucket List and got most of it accomplished. Some of my favorite memories are the little ones. So, here is a list of several of my favorite memories! Going to the Mountains - In July, the girls and I spent several days with my parents. This has also become a summer tradition. We love going to the mountains with them. We also enjoy hanging out with my brother and his kids who are about the same ages as my girls. Of course, it is wonderful to have my mom take care of me a little bit, too! Family time - Some of my favorite moments were just simple family times when all five of us hung out, relaxed, and laughed together. We had a game night and played a drawing game together. Another night, we all sat on the couch together and just snuggled while we watched TV. A few other nights we all jumped in the pool together. Natural Science Center and the Zoo - Especially my two oldest girls love animals. One day, David took the afternoon off and we went to our local science center's new aquarium. We saw all the new animals there and, then, visited the other animals they had outside. All the animals were very active that day and the girls loved seeing them. They kept saying, "This is the best day ever!" However, they said that again when we went to the zoo. It was an unusually pleasant August day and, again, the animals were active. David couldn't go that day, but his mom and our niece joined us. It was lots of fun! As summer was coming to an end, I was a little disappointed by what I perceived to be our lack of excitement and accomplishment. Although we mostly completed our bucket list, we didn't do anything big or extraordinary. We didn't go anywhere new. But, looking back, I realize that we did something much more important. We were just together. David didn't travel much for work like he normally does and our "lack" of doing big things made for the calmest, most carefree summer that we have had. 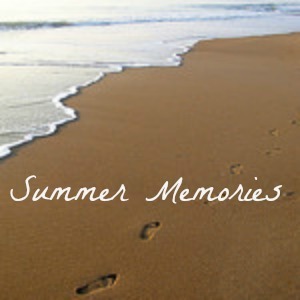 Our whole summer is one great memory that I will cherish! This post was written as part of Finish The Sentence Friday which is hosted by some wonderful blogging ladies. Please give them a visit and check out all the other blogs that participate as well! Being together is big and extraordinary. For real. One day, too soon, you'll be trying to plan the beach with your kids and their spouses. I think your summertime sounds perfectly wonderfully amazing. It's the little things that matter. I mean think back to your own childhood. The moments? They're the ones that weren't planned or considered important to your parents. In my opinion. You know I love the Bucket List idea, and may have to copy it next year. Your line about the disappointment at not doing "something big" resonated with me, as my post is all about expectation, disappointment, and reflecting on family time. Sounds like a great summer, lady! You are so right Kristi!! Thank you for that perspective! What a great summer! A calm and carefree summer sounds great to me. :) I am a little sad that summer is over and my kids are back in school, but I'm ready for some cooler weather! I didn't do anything gigantic, but all of the little trips and moments added up for me in the long run. I miss it a lot! Loving the fall things, but missing the summer things. This sounds really amazing and if I had this summer as a kid, I would never forget it! I love this! These are the best summers. I'm not a huge fan of traveling with kids and we didn't do too much of it this summer. My favorite summers as a kid were just like yours: filled with special but simple summer memories with my family. Our summer was carefree too - loved it. Have you ever visited DC with the girls? As animal lovers, they would adore the National Zoo and the Museum of Natural History. My kids could spend the whole day there! I am definitely ready for cooler weather, too! t is important and we had fun! Traveling with kids can be stressful. Lots of little memories sometimes add up to mean more than even one really big one! My favorite summers are the ones where we just relax! Your summer sounds like it was wonderful to me! It sounds like you had a wonderful summer. When it's all said and done, it's really not about all the different activities (ie: whether you accomplished everything on your "bucket list" or not) it's more - like you said - about spending time together. That happens within all the wonderful activities - but also within the day to day of just being together. great post...nothing better than just relaxing all summer...who wants to run around and not be able to enjoy your time off. I do miss my hu bby being home for dinner during the summer. What a great summer bucket list and how satisfying to know you've accomplished most of it! There are definitely great benefits to planning ahead *ahem*. Lovely post! Thanks Lisa! It was definitely nice! Thank you Katia! We had fun working through the list! The bucket list was really fun! Thank you very much Rosie! It truly sounds like a perfect summer, Lisa! It's great that you were able to make such awesome memories!